Symbolized by the Twins, Gemini star sign often feels they are being pulled in two different directions. This is why Neptune in Gemini has trouble choosing an idea and sticking with it. They love learning new things and are often inspired by their environment, but they can get in their own way. 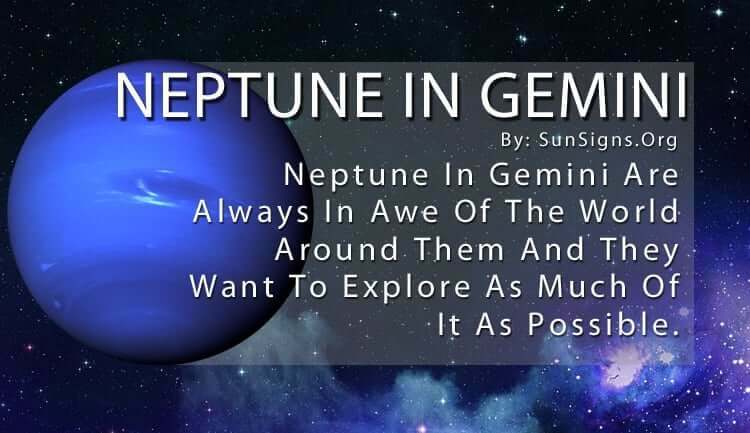 In astrology, Neptune represents fantasies, illusions, spiritual enlightenment, beauty, and creative pursuits. For Neptune in Gemini, they are always in awe of the world around them and they want to explore as much of it as possible. But because this is such a huge task they don’t know how to break it down into a more manageable goal. (Click here for Neptune planet symbol meanings). They are not great with organization and tend to be a bit scatterbrained when it comes to duty and responsibilities. This means they have trouble sitting down and creating a list of things to do. When it comes to their priorities, they only know they want to learn a great deal and then share that knowledge with the rest of the world. (Find out more about Gemini sun sign). Neptune in Gemini make wonderful educators, for their passion and excitement is infectious and they are excellent communicators. Their zest for life inspires others to take the path less traveled. But because they are social butterflies, they are often surrounded by a supportive group of people who help to keep an eye on them. It’s both their curiosity and understanding of different places and people that draws others to them. Even though they may leave their loved ones behind to go off on a surprise adventure, they only add to their social circle. They never forget those closest to them, and love bringing them along when they are able to go on such short notice! (Take the travel compatibility test). But because Neptune in Gemini is also drawn to magic and illusion, they can be swindled by those who use deception to get what they want. The Gemini Neptune sign people have to be careful to discern reality from fantasy, or else they can get pulled into a world of fraud or hypocrisy. Their curiosity can be their undoing if they aren’t paying close enough attention to their surroundings. Their open mind and generosity allow them to build up their wealth of knowledge. (Is Your Neptune Sign in Gemini?). But that’s also something others can use to gain their trust and take advantage of them. And because they are easily taken off track by the slightest distraction they may not realize this until it’s too late. The best thing for Neptune in Gemini to do is try and focus on one thing at a time. It will be difficult, but if they can learn to master even one subject it will be one of the most enriching experiences of their lives. They can still try to be a Renaissance person and learn about a variety of subject matters. But being able to spread their advanced knowledge of a special topic will help them more in the long run. Sometimes it seems as though they are speaking nonsense when they try to explain something and end up changing the subject halfway through the conversation. But if they are an expert in something, they will come across as coherent and even brilliant at times. It’s all in the way they manage their skills. If Neptune in Gemini can focus on one area to combine with their love of knowledge and communication, they will go far in life. What Is Reiki Healing & Energy?